Tsuyu, I love you and I hate you. According to the Japan Times the rainy season began 10 days early. I have a love/hate relationship with this time of year. The bad: damp tissues, moldy sinks, towels that never dry, and the smell of damp feet. The good: I love love love waking up to the sound of rain in the morning. And any excuse to linger in cafes or drink tea all day while sewing or go to movies mid-afternoon. I don’t even mind the crazy curly hairdos. 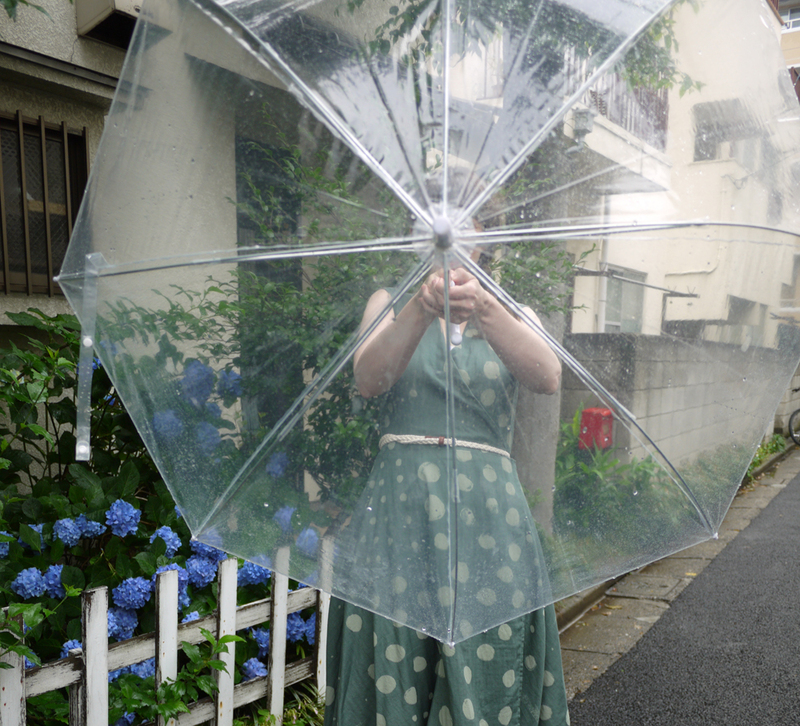 The temperature isn’t too hot or too cold, and the rain is rarely heavy enough to require more than a large clear umbrella. The absolute worst part of rainy season? The fact that when it is over, it is summer. Hot, humid, and wet but in a different, nastier way. 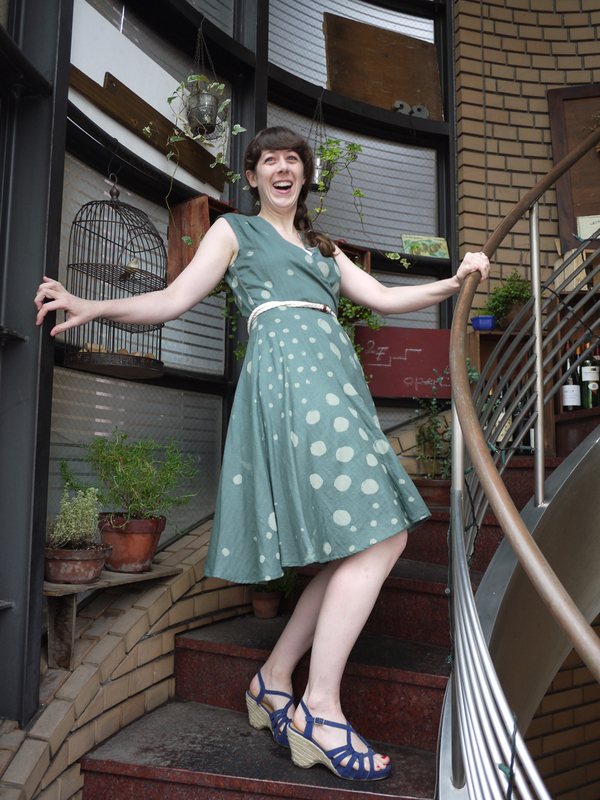 To prepare I am making dresses, and Japanese fabric is perfectly suited for Japanese summers. How convenient. 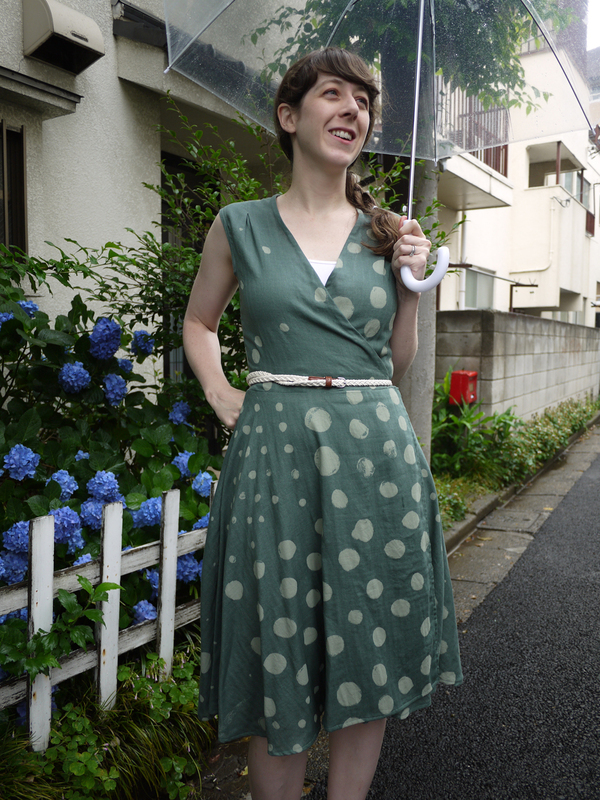 This wrap dress is made with nani IRO woodblock pocho in gray/green double gauze cotton using Vogue 8646, the first Vogue pattern I’ve tried. It was just OK. I skipped a muslin because it’s a wrap dress (read: easy to fit), and made the size 10 with an extra 1″ in length in the bodice. I could have used another inch, I think. And the bodice feels too big. I hand-stitched the hem around the neckline which gives a nice finish and removed some bulk from the front. I am thinking about adding long ties, to actually wrap this sucker around my body and tighten it up a bit. 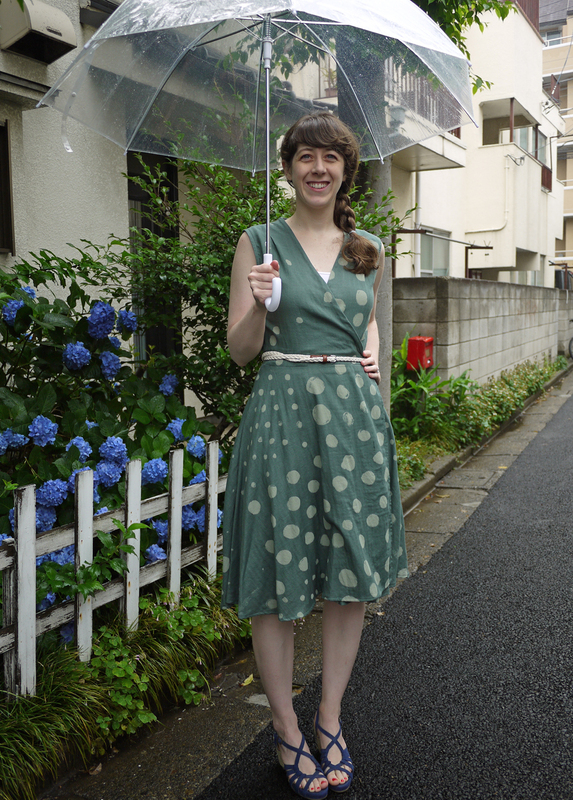 But for a rainy-season-turned-sweaty-summer dress, it’ll do just fine. Japanese double gauze is like wearing a ShamWow. Sweat-wicking at its finest, my friends. I bribed my husband into taking my picture with the promise of buying him lunch. And then this happened. Whooeee! We both ordered omurice like 5-year olds, because what else do you do on a rainy day? This entry was posted in Sewing and tagged bribe, drink tea, Japan, Japanese fabric, nani iro, omurice, rainy season, sewing, sound of rain, Tokyo, vogue pattern. Bookmark the permalink. Normally I love it when it rains, as is usually does for about half of June where I live. I love sitting next to the window with a good book or something crafty, listening to the rain outside. So relaxing! But since I had surgery in May, the rain and cloudy damp weather just bring a load of pain, so lately those days haven’t been as enjoyable for me. Ria, I hope you are on the mend soon. Take care! Thanks! Definitely doing better than I was even a few weeks ago, which is nice! What a lovely dress + cool shoes! Besides made from NaniIro, I like that this neutral tone of gray/green is so easy to match with pretty much any color! I admire you for making an effort and dress up for the rainy season! During the rainy season I can’t stand wearing anything clinging to my body. Hence this is a season of dungarees and oversized t-shirts for me! and in truth, I spend the most time in my apartment where the paper screens are starting to look very sad and droopy. let’s hit up some Shimokita cafes soon! hehe 🙂 Sorry for the Friday blues…Yes let’s do that! love the dots and the design. also the shoes! Amazing dress with super-stylin’ fabric! You have skills, my friend. just love your little dress… hey but NOT the rain and humidity. My husband and I will be in Japan (all over) next April for a month. Have you ever taken a class from Yoko Saito? She’s my idol!